Residing and Working In Germany. Citizens from some countries (including the USA, Canada, Australia, Japan, Israel, New Zealand and Switzerland) are allowed entry into Germany without a visa and may apply for a residence permit while in the country. If you don’t come from any of these countries a visa can be issued by a German embassy or consulate in your country of residence. It may also be possible to directly apply for a residence permit at the embassy or consulate in your country. The rules for what you need to get a residence permit may vary somewhat from place to place and according to your status. You'll certainly need a valid passport, a couple of “biometric” photos, proof that you have a place to live, proof of health insurance and proof that you can support yourself. Other things you may need include proof that you have a critical skill, proof that you are married, proof that you have independent means or a pension, a health certificate and a certificate of good conduct. Registering is a simple matter of going there and filling out a form. They will probably want to see a valid passport or identification card so have them with you. There is no charge for this registration. A new regulation passed in 2015 requires that you also have a written confirmation from your landlord or property owner that you actually live at the address you are registering. This form is called a Wohnungsgeberbestätigung and has to be filled out and signed by the landlord or property owner of your residence. You can download a pdf version of the form here. Every time you change your residence within Germany, whether you move next door or across the country, you must report this to the registry offices at both the old and new place of residence. This isn't an action directed at foreigners. Germans, too, must keep the police posted when they move. The two types of residence permits are limited (Aufenthaltserlaubnis) and unlimited (Niederlassungserlaubnis). The Niederlassungserlaubnis can normally only be applied for after several years of continuous residence or if certain special requirements are met. The limited permit carries an expiration date. You may be allowed to apply for an extension of that permit when the expiry date nears. Perhaps you are joining a family member who is already here. Perhaps you want to study here. Or perhaps you qualify for asylum. Such persons usually get a residence permit unless there is a good reason not to grant it, such as a criminal record or no visible means of support. Or perhaps you want to work here. This makes things more complicated. If you come from a non-EU country, a category that includes the USA and Canada, you will need a residence permit that gives you the right to work in Germany. 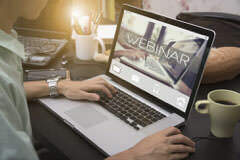 Although unemployment in Germany is lower than in past years, competition for certain jobs may be tough and it may be difficult to get permission to work in certain circumstances. Much depends on whether or not a job can be filled by a German, EU citizen or others that have earned “preferential treatment”. If you've been offered a job by a German company, it can probably help you in getting the necessary permission. For those interested in being self-employed, it is still possible to get a residence permit provided that you meet certain criteria. For more on this read the article on Setting Up a Business in Germany. People from EU countries have the status of Germans when it comes to working and don’t need special permission. If you are a highly qualified professional or have a critical skill your chances of getting a permission to work are greatly enhanced. You may very well get a residence permit and a well paying job. Germany's immigration laws are geared to making a move to the country attractive to the highly qualified. Even if they don't have critical skills there are certain cases under which a non-EU citizen is allowed to seek work. Family members of persons with critical skills can also seek work even if they don't share those critical skills. This is a measure aimed at attracting those sought after employees. The Foreigner’s Office (Ausländerbehörde) coordinates with the local branch of the Labor Office (Bundesagentur für Arbeit) to determine whether or not the permission to work is granted. Permission to work may be granted for a particular job only, not employment in general. Starting on September 1, 2011 German residence permits were no longer put in passports in the form of a “sticker”. According to the Bundesamt für Migration und Flüchtlinge these adhesive labels have been replaced by an electronic residence permit (eAT) in credit card format. The new cards have a chip on it that includes biometric features – a photograph and two fingerprints - as well as other information. A photograph is displayed on the card as well. The additional information on the chip can be used as an electronic identity document as well as a qualified electronic signature. The practical implications of this new requirement means that family members will have to submit “biometric” photos and those over the age of 6 will have to visit the Ausländerbehörde to be fingerprinted before a residence permit is issued. Download a pdf explaining more about the new electronic residence permit. 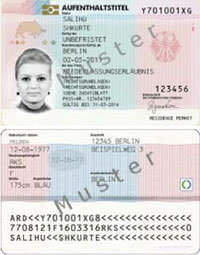 Germany is now issuing the new EU Blue Card to highly skilled, qualified non-EU citizens. For more information click here.